Students from Sewanee provide Payment for Ecosystem Services to family farmers. By encouraging the adoption of more resilient agro-ecosystems, Payment for Ecosystem Services (PES) holds promise as a mechanism for ecological restoration and poverty alleviation in the developing world. However, the scale at which small farmers can participate in the sale of ecosystem services is often not large enough to compensate for the high costs of certifying and managing PES schemes. We have implemented a PES program designed to encourage the planting and maintenance of shade-coffee based agro-ecosystems aimed at improving incomes, stabilizing soil through tree planting, and sequestering carbon in Haiti’s Central Plateau. 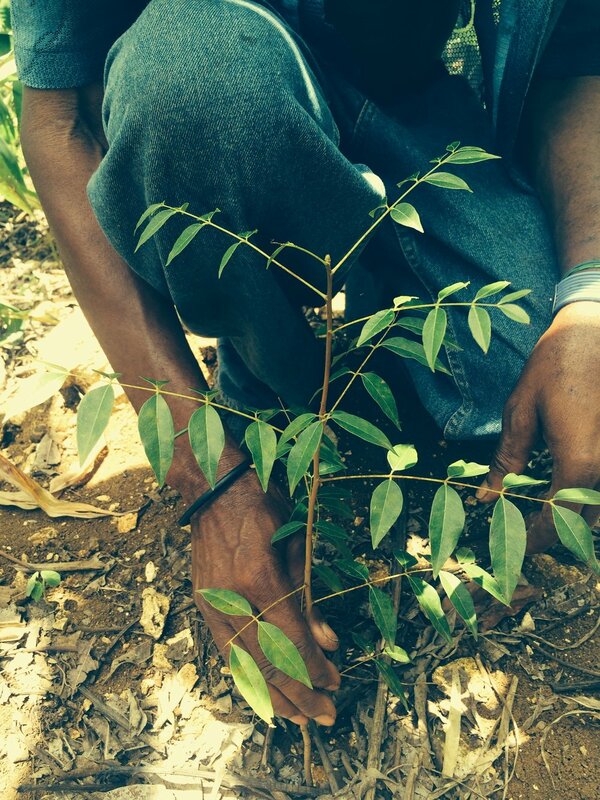 Funded by a student “green fee”, Sewanee, the University of the South, is the first buyer of the ecosystem services provided by Haitian farmers, which include carbon sequestration and the protection and enhancement of watersheds and biodiversity. In a pilot study of 45 small farms where families established agroforestry systems in 2014, we have been monitoring the impact of payments to farmers on tree survival, agro-ecosystem health, biodiversity and household livelihoods. Teams of trained Haitian and Sewanee students visit each farm every year to monitor tree survival and carbon accumulation, soil and canopy conditions and ant diversity. Yearly payments of $30-$80/farm are made to families, based upon survival data. Two years of study reveal greater than 100% survival for canopy species, suggesting that farmers are planting or encouraging additional trees on their own. Farmers are maintaining nursery stock with canopy trees and seeking out additional opportunities for tree planting. In 2016, to discourage charcoal making, payments were disbursed early to support farmers during a millet blight. With the University as a guaranteed buyer and yearly farm surveys conducted by students, this approach has greatly reduced PES program expenditures and ensured effective monitoring with 100% verification, both of which represent significant obstacles to PES adoption in a developing world context. Other advantages of this model include educational opportunities for students and community-based conversations about sustainable agricultural practices that appear to be positively impacting attitudes about tree planting and maintenance. We discuss how incorporating academic institutions as partners in developing world PES programs can help overcome challenges to PES adoption in the poorest of countries and provide incentives for the adoption and study of more sustainable agro-ecosystems. Students are involved in the verification, monitoring and modeling, as well as assessment of this PES model. Approximately 30 Sewanee and Haitian students inventory every tree on all 45 farms during March spring break trip. 5-8 Sewanee and Haitian research students collect data on the composition, structure, function and growth of the systems during 8-week internships in May and June. Active as a pilot PES program that was initiated in May 2014 (when the first trees were planted). Initial establishment of shade coffee-based agroforests began in 2014 on 45 farms in Haiti’s central plateau with the distribution coffee and other multipurpose seedlings. Farmers continue to add tree seedlings to their systems. We have collected data to begin developing growth and carbon models for some species. For now, farmers are paid a flat rate based upon a “community mean survival” plus a rate per tree above the mean survival, for both coffee and shade trees. The funds come from the green fee (described below). Since March 2015 (2 years) farmers have received annual payments based upon results from seedling survival inventories. None yet, currently Sewanee students pay an annual green fee of $14. Students can sign up to have the $14 green fee used to offset travel associated with outreach trips, study abroad and study away. Not yet using official protocol. Instead, teams of Haitian and Sewanee students are trained to inventory every seedling at every farm for survival, diameter (mm) and total height, from which growth is calculated. Not yet calculated/assessed – currently paid per tree as systems and carbon models are being established. Not yet calculated, in progress.